Three finance-related events are currently gaining great attention in the media. One is the so-called Panama Papers, the exposé of tax avoidance on a scale that is absolutely breathtaking. Another is the proposal by the Labor opposition to have a royal commission into the banks. And a third is the furore over the unaffordability of homes and the debate over negative gearing. On the surface they would seem to be quite separate issues. But there is a common element. Banks. All three issues demonstrate yet again that banks are, if not the most malign organisations on the planet, then certainly among the most dangerous. The role of banks in the tax avoidance case is less obvious, but it is there. The law firm in Panama, Mossack Fonseca, has said in its defence that it does not know who the real clients are. It protested that it only deals with banks or accounting firms, which have specialised in creating a class of wealthy people who can avoid many of their financial obligations to the country in which they are citizens. Such a reckless approach to social obligations is consistent with the logic of banking. Its only aim is to make money, and the only purpose of clients is to provide an income that can service interest or pay fees. Given free reign, banks will turn entire societies into little more than interest paying vehicles. In Australia it can be seen with household debt, which is running at over 120 per cent of GDP. It is why houses are out of reach for many young Australians. As economist Michael Hudson outlines in his book Killing the Host, banks, unleashed by the nonsense idea of financial deregulation, have 'sought to control democracies by shifting tax policy and bank regulation out of the hand of elected representatives to nominees from the world's financial centres'. It has been a world-wide power grab that has created a new form of serfdom. Instead of funding productive activity, which represents only about 15 per cent of bank lending, they have reinforced rent-yielding privileges for real estate, resources and monopolies. "American and European authorities decided to save the banks at all cost. The strategy was not only immoral, it was, in the end, impractical. The game is now up." The banking disaster has been especially pronounced in poorer countries. John Perkins, in his book Confessions of an Economic Hit Man, points out that over the past three decades, 60 of the world's poorest countries have paid $550 billion in principal and interest on loans of $540 billion, yet they still owe $523 billion on those same loans. The cost of servicing the debt is more than these countries spend on health or education and is 20 times the amount they receive annually in foreign aid. And it is not just developing countries. The recent savage government cuts in Greece were entirely for the purpose of making sure that German and French banks received interest on their loans. Indeed, in the wake of the global financial crisis — itself an extraordinary exercise in banking recklessness — most of the developed world is under the thumb of banks. American and European authorities decided to save the banks at all cost, even if that meant immiserating everyone else. That is what the policy of 'austerity' meant, making sure that the banks got their interest payments. The strategy was not only immoral, it was, in the end, impractical. The game is now up. First world debt is now so large it is unpayable, which is why interest rates in most of the developed world are zero and, in some European countries, negative. Average debt to GDP is running at about 170 per cent in developed economies. The only solution is to all but remove the cost on that debt. In many ways, it is a story as old as the admonition against usury or the practice of debt forgiveness, which Hudson reckons dates back to Bronze Age Mesopotamia. Simple arithmetic indicates that there will always be banking crises because real wealth creation can never keep pace with compound interest. The only difference now is that we are seeing the pattern played out on a global scale. There are two obvious options. One is to let the world economy continue in its semi-comatose state with the new 'serfs' being kept going by the finance sector parasites so they can perform their primary function of paying interest. Or there could be debt forgiveness. The first candidate might be the country that has been under the debt cloud longest: Japan. Its debt is currently over 240 per cent of GDP, but it is mostly owed internally so it could be forgiven without a catastrophic loss of sovereignty. What is also needed is a realisation of just how dangerous banks have become. The misdeeds that have led to calls for a royal commission are just on the surface; the deeper problem is that the finance sector has co-opted the entire system. As Hudson observes, financial lobbyists have taken the idea of 'free markets' and redefined it as 'freedom from public ownership or regulation'. Thank you David for an excellent, enlightening article. The thing about banks is that they produce nothing useful, creative or worthwhile, nothing even remotely human. The problem is unquestioned compound interest rates which accumulate money automatically and increase gap between rich and poor. Piketty shows how trickle down does not work. Lietaer and Kennedy show alternative currencies that permit the continuing functioning of society without inflation. Look up post growth ! But banks were always against it. Why would that be ? David James has summarised very cogently what is wrong with the finance sector not just in Australia but world wide. I suppose the Opposition doesn't want to confuse the electorate by trying to convince them that the Australian finance sector as a whole, not just the banks, is why most borrowers will be paying interest ad infinitum. Therefore they call for a Royal Commission into the banking sector where the banks' misdeeds are more obvious. This however plays into the hands of the government which points how the ACCC, ASIC and APRA etc have kept the banks in line, or have had them prosecuted. The government must surely know that the banks misdeeds are minor compared to their enmeshment in the entire financial system. 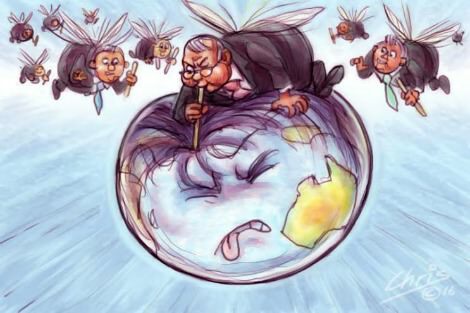 Financial sector lobbyists, whose tactics the PM must know well, will be warning the government that a Royal Commission into the financial sector could expose the modus vivendi that Australia has had to accept if it is to be part of the world wide finance market. The bluster of the Treasurer and the automated clichés of the Minister for Finance do not augur well for sensible discussion on this issue. More from David James please. Thanks David for this contribution to the discussion. I don't know if debt forgiveness will catch on. Too many of the privileged have too much at stake unless they take a broader view of what is at stake. Putting it very simply, these people have my money. They have most people's money. If ever there was an argument for their social responsibility, this has to be it. We need to have confidence in how they are managing our assets. They owe us that much and if a Royal Commission is required to do that, then bring it on. Time to nationalise the banks? To reinvent a real Common-Wealth Bank? An excellent article which makes its case cogently and concisely. Whether something will now be done is a moot point. It is a pity that state banks and the Commonwealth Bank as it was originally envisaged have all been privatised. In this new feudalism, as in the old, millions of lives are thwarted and unfulfilled. The serfs will not endure it forever. I like the suggestion made by Ginger Meggs. A retired bank manager once said to me that the rot set in with banks when the Commonwealth Bank was sold. It set an ethical standard that disappeared with it's demise.